Official artwork of a Healing Field from Super Smash Bros. Ultimate. The Healing Field (チーム回復フィールド, Team Recovery Field) is an item introduced in Super Smash Bros. Ultimate. King Dedede and Jigglypuff getting healed by being in the Healing Field. 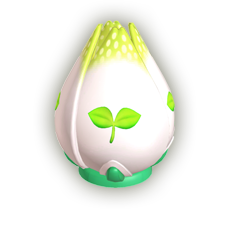 The Healing Field has the appearance of a large white bulb with a dark green bottom and light green on the top of the bulb and a picture of a sprout on each side. When the bulb is thrown on any terrain, it opens up and creates a small, green, circular area which heals fighters as long as they stay inside of it. It heals whoever threw it for 2% per half second, and everyone else for 1% per half second. This page was last edited on March 5, 2019, at 23:04.